Alongcamepollly: My Interview with Marian Duggan in the Western People! My Interview with Marian Duggan in the Western People! As some of you may know (because I have used every social media outlet at my disposable to tell people) I was featured in the Western People this week! I was approached by Marian Duggan to do an interview to which I gladly agreed! I wasn't sure when it would be printed so when I opened the paper on Monday I frantically flicked through the pages and saw my picture on an entire page! My jaw dropped and I couldn't read the words fast enough... Just to see the interview in a newspaper and to be called a blogger was so exciting for me I literally haven't stopped smiling all week! You may have read it but if not here is the entire interview, some questions didn't fit in! I'm 24, soon to be 25, I'm the eldest in my family, I have two sisters Romy & Amber and a brother Tristan and of course my mum and dad Karen and John. I have always had a love for clothes and dressing up, probably because I spent the first four years of my life as an only child so my parents only had me to worry about! I spent the majority of my time in colourful dresses which were reluctantly handed down to my siblings. I had a complete obsession with The Wizard of Oz as a child, and an obsession with being a princess, an obsession which stayed with me. I'm lucky to have one of my biggest style icons living with me- my mum. I know it's a cliche, but my mum is the reason I have such a love for fashion. As a child neither of my parents stopped me from exploring my individuality (probably because they thought I would have grown out of it at this stage), and seeing my mum's wardrobe full of beautiful clothes educated me on how to dress. I wanted to begin a blog for a few years and can only blame total laziness as my sole reason for it taking so long. I wrote my first blog post on the 11th of September 2013, I set up my Facebook page and it all went from there. My blog is my way of expressing my love for style, embracing your own individual style and having confidence with it. I share my outfit posts, I give tips on beauty, fashion, and I post pictures I take inspiration from. - Where did the blog name come from? It's a bit random! My friend Therese and I went to a festival about 6years ago and used fake names because we thought we were cool, I used Polly, changed my Facebook name to Elisha Polly Greham and it literally stuck and I haven't changed it since! So when I set the blog up I knew I had to incorporate 'Polly' in some way. I always loved the film, and was afraid it would get mistaken for that so I put another 'L' in the blog name! - Tell us about your daytime job and if it ties in with your blog? I work in Foody's Pharmacy in Ballina, and it ties in so well with my blog thank God! We don't have a uniform we can wear whatever we want as long as it's black, which is great because it means I have to get dressed up and think about my clothes and outfits every day. I also do a lot of Skincare & make up blogging and all of my favorite products are lines that we stock. I would never blog about anything I didn't genuinely believe in, so the fact that we have such fantastic ranges at work is very handy! -Perks of having a blog? It's great for my confidence, having a platform to voice my opinion on fashion and beauty and get feedback from people who read my blog. I'm relatively new at this so I'm not drowning in 'blogger mail' unfortunately! I have received a few free products to review which was great, but that's not why I started this blog, free stuff is just a huge bonus! The biggest perk I have to say is meeting people through it, like other bloggers, or even random people on nights out! -Describe your blog in one sentence..
'Dressing up begins at the age of five and never truly ends'. -Your favourite post so far? It would have to be the post I wrote on the 03/10/13 titled 'The world needs some excitement from fashion'. It sums up what I believe most about fashion- to have fun with it. Clothes are a way of expressing your personality before you speak. That's not to say wear something mad, you must stay true to yourself but not be afraid to shake it up a little bit! Sometimes if I wear something a little out there for a second I care what people think then I really don't care, you have to have confidence in yourself- even if you have to fake it! My personal style changes a lot with my mood. I'll usually be seen in a pair of brogues everyday at work or if I'm off I'll be wearing a colourful outfit of floral trousers or a tulle skirt. My style in one word I suppose is 'fun', it says exactly who I am, even if I'm wearing all black I'll try and add something to make it more fun. I love 50's, 60's and 80's style, I love florals, pastels and anything kitsch and matching. -Must have pieces this season? I'm probably a very bad fashion blogger because I wouldn't be one for religiously following trends, my personality can be quite defiant so maybe that's why! I think trends are very selective and don't take the rest of the average female population in mind. I believe in buying key pieces that you can make lots of outfits from- a great pair of jeans, a well tailored blazer, an expensive leather jacket which will last for years, and a great black dress! However this season will of course see the return of florals & pastel with the 'Statement Short' being a lye piece for the summer, pair it with a crisp white shirt loosely tucked in to keep it laid back. My go to outfit when I have no time to decide what to wear at all will always be a black dress. I know it's very typical, but you can bop never go wrong with a black dress, stilettos, bouncy hair and a slick of red lipstick. There are so many to mention but mostly the Irish bloggers who are making waves in the fashion world, Ciara O'Doherty, Retroflame, Anouska Proetta Brandon, Leanne Woodfull, Haute So Fabulous, and not to mention ALL of the amazing bloggers from the 'Into the West Blogging Network' who are all listed in my latest blog post! I take my inspiration mostly from everyday women on the streets of Dublin, London, and Galway. If I had to choose a person I would have to say Carrie Bradshaw. She never dressed for anyone else only herself and never cared what anyone thought, she had fun with clothes and I love every outfit her character ever wore! -Tell us about the blogging day you were on recently? I recently attended an event in the beautiful G Hotel in Galway for ten 'Into the West blogger Network'. This group was set up by the inspiring Sinead Carrroll of Yummy Mummy Fashion and lifestyle blog, and it is a group of bloggers room the west and surrounding areas who blog and want to meet other people to gather tips and hopefully further our careers as bloggers. This was my first ever blog event so I was so excited! All of the girls were so nice, it was like we were friends for years! We met up, had delicious Afternoon Tea in the incredible rooms of the G Hotel, had lots of very girlie chats, exchanged tips and even received some great goodie bags from Cara Pharmacy and the Publicity Loft. It was a fantastic evening and it was great meeting other like minded people and sharing our experiences as bloggers! We have a facebook page which contains posts from each of us, each week being a different topic. I'm very much looking forward to our next meet up! When I go to - PENNEYS I always spend money. It's important that women... Dress for themselves and not anyone else. Have fun with clothes but stay true to yourself, always be comfortable in what you're wearing and HAVE CONFIDENCE! My next must have purchase is.....a well fitted pair of denim dungarees ala Danielle Bernstein of super blog We Wore What. I pick my clothes out ..... From a never ending pile on my bed. If I could...win the lotto I would wear House of Holland clothes everyday. This was my first interview for my blog and hopefully won't be my last..huge thank you again to Marian, the Western People and my friend Laura for no doubt giving me a great plug at work in the WP! 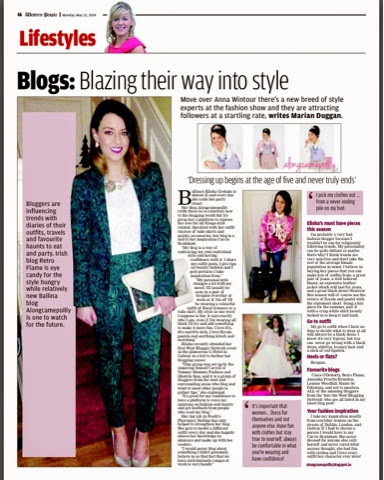 Look up from your phone, shut down your display..
My first piece for Mayo.today.ie! The Aussie Blog Awards- and my plea.....!